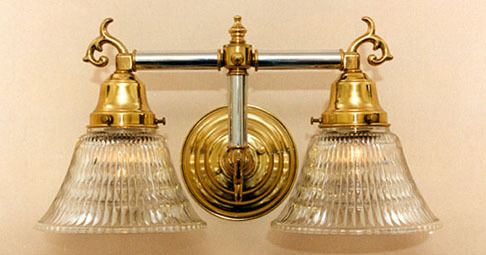 As with the previous sconce, the "T" design is carried through. This one's design is lovely with mixed metals. Polished Brass with Antique Pewter tubing as accents. The reverse can be designed as well if that's your choice. Talk about Country French! Imagine this wall light in a rustic home on a hillside near a vineyard. Interior Designers love this style! Shown in Polished Brass and Antique Pewter. Available in different Metal Finishes, different Glass, Back Plate, multiple arms and many other Custom Options. Width 15 In. / Projection 7 In. / Depth 9 In.